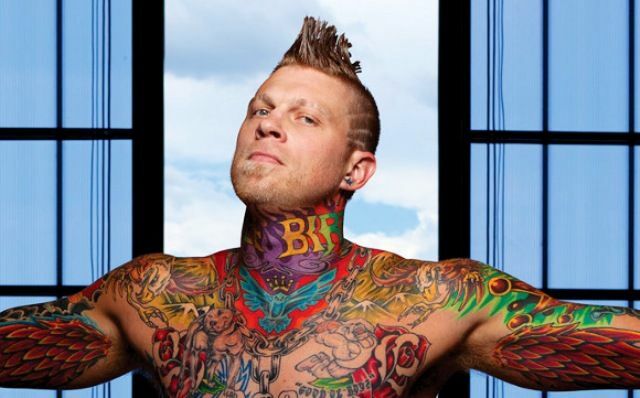 Chris Andersen is known for brightly colored tattoos on his arms, chest, neck, back, hands, and legs. According to Andersen’s regular tattoo artist, Denver-based John Slaughter, Andersen has inked 65 percent of his body with colored tattoos. “I like all of them, it ain’t something I regretted. It wasn’t like I got drunk and went and got a tattoo. Every tattoo has a meaning.’’ said Andersen. He is also famous with the names like – the Birdman, the Ink-Obsessed big man simply because of his giant colored body flaunting a mohawk hairstyle. Chris Andersen is rapidly running out of places on his body where he can get a tattoo. Andersen has phoenix wings in vibrant colors on the inside of each of his arm. This body ink carries deep meaning for him as this ink was of the time when he was serving his drug suspension. Andersen once admitted to crying “like a little girl” while getting his wing tattoos on both his inner biceps. He has tattooed a pair of red dice on his left arm. “DEAD END” is inked in bold black color in between the phoenix wings and the red dices. This tattoo is inside of a black square on his left arm. Chains are tattooed on both of his arms. 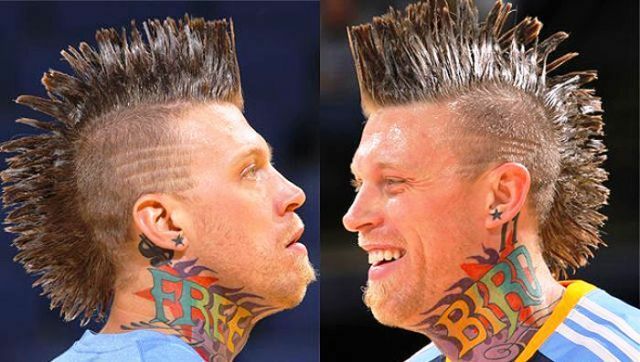 Andersen has “FREE BIRD’’ with colored flames tattooed across his neck in bright yellow lettering. He is a fan of the “Free Bird” song by Lynyrd Skynyrd. This song has a connection with him as he used to listen to it regularly during his drug suspension. He once said that the tattoo also had something to do with having just broken off an engagement. The back of his mohawk hairstyle is now framed by tattoos. The words “GIVE ME WAR” in blood red color are inked on the bottom. The Birdman appears to have raised his tattoo game with this new ink behind his head. There is inked “FOREVER NIGHTMARE” at the back of his neck in a stylish manner. The word “PUNK” is inked on Andersen’s left hand. On the right part of his neck, there is a dollar cash sign behind his right ear. There is a star on Andersen’s both ears, and these are appearing like his ear studs. The Number 11 is inked behind his left ear. On Andersen’s right arm, there is a tattoo of a basketball player making a making a Slam-Dunk. The word “COUNTRY” is inked in capitals on his right arm. There is a scary skull tattoo on Andersen’s left bicep. A tattoo of a giant crown just above the skull is there on his left arm. Chains are tattooed on his upper chest also. The words “HONKY TONK” are inked on Andersen’s stomach. A snow crystal is tattooed on Andersen’s left elbow. “SCREW YOU” is tattooed in capitals on all the fingers of each of his hand. Andersen has a group of dark black colored flying birds inked on his left leg.